Isiah Factor | The Insite » GLORIA OLIVER HAS A WAY WITH WORDS! GLORIA OLIVER HAS A WAY WITH WORDS! August 29, 2008 | Posted in Uncategorized | Comments Off on GLORIA OLIVER HAS A WAY WITH WORDS! THE PERFECT PICTURE OF KNOWLEDGE AND COURAGE! It’s likely something you can only get from an older person who’s seen a lot in their life time. It’s that feeling you get from a person who’s the perfect example of knowledge and courage. I think I got that today from a New Orleans resident by the name of Gloria Oliver. I was interviewing her about the approaching storm we now know as Gustav. I think the 65 year old hypnotized me with her words. I lost track of thought and forgot what I was doing because she made me just want to listen to her words. 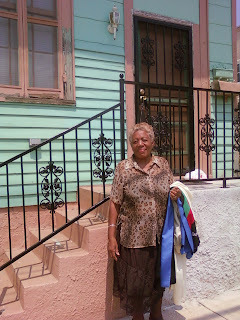 She talked about the devastation and death she witnessed in Katrina. She talked about losing her home and mother in a matter of years. She talked about the crumbling community she lives in. She talked about a lot but through it all Ms. Oliver says she has endured. The Treme resident says her faith comes from God and God alone. Her words of wisdom was like opening a good book you’ve been waiting to read. She was truly a pleasure to meet. A person i will probably never forget. Ok, I’ll stop now before it sounds like I’m crazy. I just hope all of you run into your Ms. Oliver. She makes the problems we endure seem very bearable. Just a day in New Orleans for me!